Decorative painting is a great way to add character to any space. Reproducing marble is an art form that can be applied to any area where you would want the look of real marble. 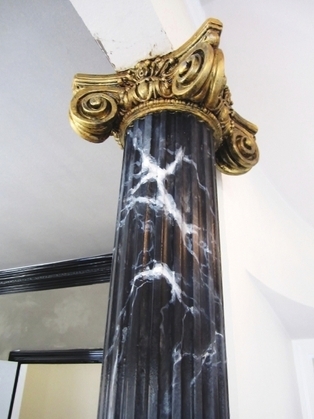 Design requirements for this project called for the fluted columns to have a finished look of black marble and white veining details with capital and base having an antiqued gold finish. On each column there are areas of the marble that are transparent while other characteristics of the marble fade into and out of the finish to give places of strength and other places of calm so an overall look of natural variation can be achieved. The possibilities are endless and creative finishes such as this can instantly change the look and feel of any room for years to come.